Grandmaster M R Venkatesh (BPCL) with 8.5 points won the 66th Birthday celebrations of “Thanga Tharagai” Puratchi Thalavi AMMA Honorable Chief Minister of Tamil Nadu lightning chess tournament that concluded at Multipurpose Indoor Stadium, Chennai here today. In a three way tie to the top, Venkatesh (8.5) emerged the Champion in tie-break ahead of Grandmasters Krishnan Sasikiran and S P Sethuraman. In the crucial final round, Venkatesh, playing with black pieces, held top seed Sasikiran to a draw. The winner takes home a cash prize of Rs 66000 among the total prize money of Rs 202000 (Rupees Two Lakhs two thousand only). 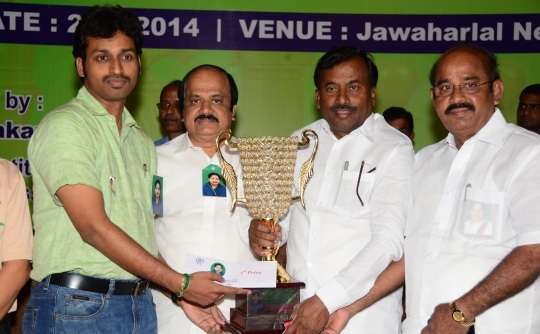 The prizes were distributed by Shri N Balaganga, MP and Shri Saidai Duraisamy, Mayor of Chennai. Present in the dais were Shri JCD Prabhakar, MLA, President, All India Chess Federation and Shri D V Sundar, Vice President, FIDE respectively. The nine round lightning event attracted 1035(!) entries including nine Grandmasters, 12 International Masters among 32 FIDE titled players. Earlier, the annual event was inaugurated by Tmt. B. Valarmathi, Hon’ble Minister for Social Welfare, Government of Tamil Nadu.